San Agustín, Manila galleon under the command of Portuguese-born navigator Sebastian Rodriguez Cermeño used for explorations of the coast of California in 1595. She was wrecked in northern California by a storm at Drake's Bay. Upon Cermeño's return to Spain, he was disgraced for having lost his galleon. By the end of the sixteenth century, the route between New Spain and the Philippines had been firmly established. The piratical endeavours of Drake in 1579 and Cavendish in 1587 alerted the Spanish authorities of the need to explore the northern Pacific coast (Gerhard 2003). Thus, Viceroy Luis de Velasco commissioned the skilful Portuguese sailor Sebastian Rodriguez Cermeño to explore those latitudes on his return voyage from the Philippines (Bancroft 1886:96). Cermeño ́s San Agustín, was a 200 ton ship carrying considerable volumes of porcelain and other goods. It left Manila in July 1595 and on early November, reached California (Junco and Fournier 2008:70). 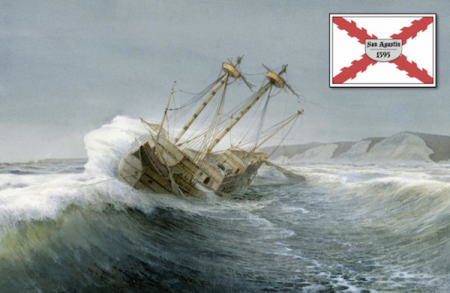 The shipwreck occurred during a storm in what is today known as Drakes Bay (Bancroft 1886:88). The surviving crew built a craft that made the trip south in an almost fictional account (Wagner 1924): the crew starving to death ate the accompanying dog and even the rotting corpse of a beached whale. None the less, they survived the ordeal and finally arrived at the port of La Navidad. Years later, in 1603 Sebastian Vizcaino's expedition entered the Bay with some of these sailors, and found no trace of the ship. It was not until 1940, when archaeologist Robert Heizer (1941) excavated a dozen Indian sites in the vicinity and found traces of iron and Chinese porcelain. In 1982 the Submerged Cultural Resource Unit (SCRU) of the National Park Service (NPS) carried out a survey with a magnetometer in the bay, possibly identifying the wreck site (Delgado 1998:357). A few years later, Robert Marx got a license to exploit commercially the wreck, but the strong position of NPS officials stopped the treasure hunter who planed to sell some of the artifacts found (Ibid.). Some of the porcelain picked up by beachcombers has been studied and compared to other collections such as the Drake cargo, helping to establish a chronology (Shangraw and Vonder Porten 1981; Shangraw and Von der Porten 1997; Von der Porten 1972). This page was last edited on 7 December 2016, at 20:17.